This year due to popular demand tickets for all concerts will be available locally from A.P. Taylors, Main Street Campbeltown and on-line from Ticketweb from June 21st at 10.00am. 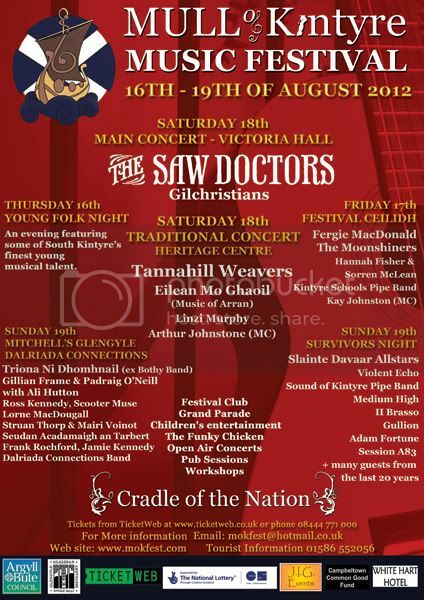 This years headline acts are The Saw Doctors, Tannahill Weavers, Fergie MacDonald and Triona Ni Dhomhnail ex Bothy Band vocalist. For more updates go to the website at http://www.mokfest.com which has just been updated with all the information on this years 20th Anniversary Event. We have had great response to the line-up this year and expect that demand for tickets will be high this year. Hey everyone this is your last chance tonight to buy your tickets on-line as they are only available from AP Taylors after that. Tickets for all the concerts from 17th - 19th Aug are still available on-line and the Young Folk night can only be bought locally.